See inside the reviews below. Card is now banned. Wally came out in Roaring Skies, just a few months behind his sister Hex Maniac…not actual sister, card sister. His effect is all about evolving Pokemon, letting you search your deck out for a card that evolves from one of your Pokemon that’s not a Pokemon-EX and evolving it. The thing that made him so special though was the additional “You can do this on your first turn or on a Pokemon that just entered play” clause, meaning you could accelerate the process of evolving your Pokemon with ease. Now back in the days of Roaring Skies, Wally…didn’t really see that much play. The format was more heavily defined by the powerful M Pokemon-EX, which Wally couldn’t be used to bring out, so he was relegated to smaller evolution decks. Things like Vespiquen could use Wally to bring out their main attacker that much faster. But as far as power plays go? Wally wasn’t a contender. So why ban Wally now? 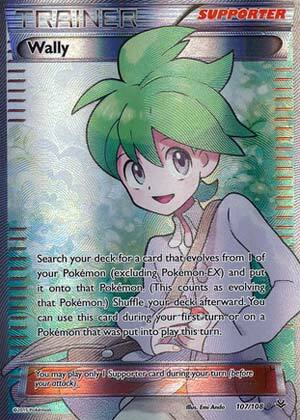 Well as the Expanded format has only grown, there’s been a new kind of Pokemon that Wally can be used with: Pokemon-GX. The evolutionary equivalent to Pokemon-EX, Pokemon-GX had the benefit of not only rivaling the stats of other Pokemon-EX/GX, but if they could evolve off of another, Wally could bring them out easily, even on the first turn. As more Pokemon-GX enter the game – and the Expanded format as a result – Wally begins to go from a fairly balanced underplayed card to something that can bring out powerful Pokemon far too easily. Go figure, the only thing that could get Wally banned is if Evolutions became more powerful. And with Pokemon-GX entering the fray, Evolutions have become much more powerful. Arora Notealus: Wally himself has only been reviewed once, and that was at the time of his release back in Roaring Skies. It’s interesting to see a card that’s incredibly unassuming become busted by the mere presence of another card or another set of cards. A great example comes from Shiftry, which was previously on the Ban List until the Pokemon Company decided to exchange it for its partner-in-crime, Forest of Giant Plants. Side Review: Eneporter – moving Special Energy around can be disruptive against your opponent, but these days there aren’t that many Special Energies to move around. DCE and Rainbow Energy both benefit whatever Pokemon they’re attached to, unless that Pokemon hates have free Energy, so Eneporter isn’t exactly that great. With so few Special Energy otherwise, it doesn’t really have a lot of opportunity to get played. Maybe in Expanded it’ll see some tech play? Next Time: For this Throwback Thursday, we’ve got a special guest! Wally was banned from the Expanded Format due to potentially using him on the first turn of the game when there’s an Active Phanthump. With Trevenant being a Stage 1, this particular card from the XY Base Set has an ability that locks your opponent from playing item cards while you still get to play yours. Because it prevents your opponent from playing certain cards before they even get their first turn, it was deemed unhealthy that Wally had to be banned. Some may argue that Lysandre/Guzma may get Trevenant out from the Active spot, but such an answer isn’t always available and Trevenant might be the only Pokemon in play, rendering both Supporters useless. If Forest of Giant Plants wasn’t enough to discourage a one-sided lock, Wally now gives you another reason to discourage such a strategy. Very apropos for our old friend Wally who has been in the Standard format since 2015. How can a card that didn’t even come close to making our top ten cards lost to rotation list actually get banned from the game altogether? No top finishing decklist available to me even played a single copy of this card between May 19 and June 23. Even the likes of Hala, Plumeria, Delinquent, and Fisherman showed up at least once in someone’s list. Wally? Nothing. And yet he’ll be completely wiped away from the game, that laughing, happy boy holding up Ralts never to be played again. And why? Because of some ugly mean old Tree Ghost. Sometimes life just isn’t fair. The most I ever used Wally was experimenting with him as a four of in Greninja decks, really trying to get the turn 1 (going second) Water Dupes. I was only able to pull it off about 40% of the time though. And while I think I won something like 75% of those matches, I won less than half of the time when I wasn’t able to get Wally in hand turn 1. I found running four Alolan Vulpix to be far more effective, and that quad Vulpix with the Beacon attack was the archetype I always had the most success with in my Greninja builds. I actually always thought Wally was a little underpowered. I wished he’d been able to take Basics directly to Stage 2’s, maybe even on the turn they were put into play. Maybe that’s a little too much, but considering everything going against Stage 2 Pokemon in the game today, wouldn’t it be worth it to find out? Why not give Stage 2 Pokemon something to help them keep up with the Big Basics? But yeah I get it turn 1 Item Lock is just too powerful. Next in our Whine & Cheese Week is Wally Wednesday where we look at Wally (XY – Roaring Skies 94/108; 107/108; Generations RC27/RC32). Wally is a Trainer-Supporter with a two-part effect; the wording is such that you must be able to perform both parts of the effect. It might seem a bit odd to worry about that – especially as the card is about to be banned – but this is just a handy way to remind folks that banned cards still have their shortcomings. You see, Wally allows you to search your deck for a card that Evolves from one of your Pokémon already in play, then immediately play that card onto the appropriate Pokémon to Evolve it. It has to be the next Stage of Evolution (no jumping from Basic to Stage 2), you cannot select a Pokémon-EX (presumably for either part of the effect, not that it should matter), but you can use this card the first turn a Pokémon is in play, including the very first turn of the game. So, as long as you don’t have all copies of a particular Evolution Prized or in hand, you just need the correct lower Stage on the field and a Wally to guarantee that Evolution hits the field. Yes, “lower Stage”, not just “Basic”; not only can Wally advance a Basic Pokémon to a Stage 1, but a Stage 1 to a Stage 2, or anything else so long as they do not Evolve from (or into) a Pokémon-EX. This includes unusual Stages like BREAK Evolutions or Pokémon with additional mechanics like Pokémon-GX. Now, why am I focusing on this when Wally was explicitly banned because it allowed decks built around Trevenant (XY 55/146) and its “Forest’s Curse” Ability to create a T1 Item-lock? Even if it is only a fringe minority, I know some players are upset that Trevenant did not get banned instead; it isn’t Wally’s fault that before Wally was made, the developers created a card like Trevenant. If Forest’s Curse is causing the problem, get rid of it and leave Wally alone, right? Wrong. Not because I think most decks can adjust to avoid a T1 Item-lock being an effective auto-loss; the Expanded card pool is such that decks are Item-reliant and if you build a deck that isn’t you’ll struggle against everything OTHER than the anti-Item decks. Not because there are counters to Trevenant’s lock; they tend to be hard to draw into with your Items locked. Not because I think Trevenant is perfectly balanced; I’m still a little skittish because a good Trevenant deck will give you all of one turn’s worth of Items before it gets Trevenant to the field, thanks to Phantump (XY – BREAKpoint 64/122). Then again, Trevenant is impressive specifically because of its Ability and Dimension Valley, which is why that Phantump and Trevenant BREAK don’t have a Standard Format deck, even though there is a different Trevenant available in that Format. No, the issue is that Wally will always threaten to “break” various older cards due to potential future releases, let alone risk breaking those future releases directly. Simply put, either the designers have to pre-nerf all Evolutions to account for Wally… and even then, they have to hope they didn’t lowball their estimate of an Evolution line. Yes, the entire line matters. One of the things we’re seeing more of are lower Stages with tricks that help the entire Evolution line; something I think is great on its own. The problem comes from generic Evolution acceleration. We already have some Pokémon with Evolutionary shortcuts specific to them and their respective Evolution lines, but with Wally, there will always be a risk that the combo enables some crazy Stage 2 to reliably hit the field Turn 1. That is on top of just having to worry about a really good Stage 1 hitting the field reliably T1. That generic Evolution acceleration is too potent, especially when it works T1, shouldn’t be a surprise but it did catch us off guard. Could the powers-that-be re-release Wally with an erratum so that it didn’t work that way? Sure, but even if they did, that eliminates only some of the risk, not all of it. Simply put, a “safe” Wally is Evosoda. So even though I wish he could stay for some of the decks he helps, Wally can’t be selective and help only the decks that aren’t broken by it. As a reminder, a card getting banned, even when I agree with the ban (and I do in this case), will NOT receive an automatic 5/5 before its rating becomes N/A. These cards are not perfect, or “beyond” perfect; many broken cards are broken because a specific niche, and (disturbingly) could plausibly have been printed as something even more potent. I’ll also add that you can see our original Wally review here where (I think) it was a runner-up for our countdown of XY – Roaring Skies cards. Wally was actually a runner-up for our countdown of cards lost to rotation for this year. It only managed a 37th place finish because the only one who nominated it was me, and even on my own list Wally was only 17th place. It made that list because I knew what it could do in Expanded, and figured it thus had potential if it remained in Standard.